NYC: Now With 30 Percent More Syphilis! Bloomberg's report shows a sharp spike in syphilis cases. Isn't that a disease from the era of rickets and scurvy? We investigate. 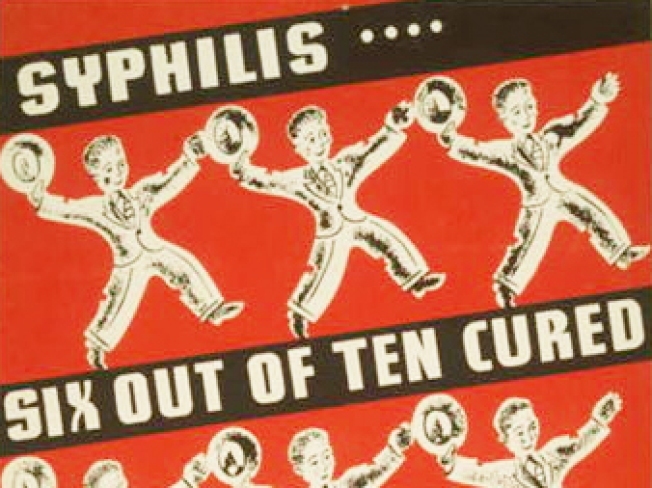 This Depression-era PSA educated people about syphilis -- which is on the rise. You may have missed the Mayor's management report (the what? exactly), which earlier this week unleashed a stream of generally boring city data (about things like street cleanliness and noise reports) on a populace which probably has bigger fish to fry -- like, say, panic about recession 24/7. But! The Daily News flags an uptick on two NYC fronts of note: Murder and syphilis. Murder, we get, but syphilis? How 16th century! We're more used to reading about your web-era STDs (like chlamydia and gonorrhea) -- syphilis kind of seems like it belongs on a list with scurvy, rickets, and the plague. But if the city's reported cases are up 30 percent in a single year, we should probably educate ourselves. * So, what IS syphilis, exactly? Its first appearance might date back as far as the 13th century - in an English monastery! Though they called them "friaries" in those days. Hmm. In the 1500s, it spread like crazy among "invading armies or sea crews," what with their fondness for prostitutes. Remember leprosy, a.k.a. the my-body-parts-are-dropping-off disease? Apparently, it was often just misdiagnosed syphilis. Good to know! Celebrity syphilis-havers include Napoleon, Henry VIII (blame it on all those wives), Van Gogh (for whom, really, syphilis was the least of his problems), Al Capone, and Hitler! It's mostly condom-preventable and treatable with penicillin. So, whew. *Note: please don't consider a blog post a reliable source of medical information.